On Tuesday, 3/12/19, at approximately 2:15 pm - without warning and very startling, the building adjacent to the Sungloss Marble and Terrazzo Co. Offices - started collapsing from the roof downward. The collapsing building sent hundreds of bricks, debris, roofing materials, the est. 70# Metal chimney and, only God knows what else, tumbling to the ground, our roof, our rear stairwell (where two of the best tenant-residents in the Universe live, quietly ) missing some employees, the residents and others by minutes, perhaps an hour in other cases, returning from restoration, cleaning, sealing and otherwise renewing both historical, old and recently damaged marble, granite and/or terrazzo surfaces across Chicagoland. Or, our dedicated OM, Perla G. who was missed by a whisker. No marble, granite, limestone, slate, onyx or other Natural Stone was used on that collapsing building, just masonry bricks, now, at the time of this writing, are being salvaged. During the collapse, top rep. Leslie O., had the wherewithal to call 911, get the Chicago Fire Dept. and the Chicago Police Department over "in a hurry". They were then very professional, and sensitive to the situation. Local and national news - WGN, ABC, Telemundo ( Latino Channel ) and probably others where soon on hand - as was our proverbial helicopter - to bring the collapse to the public from Portland, OR to El Paso, TX, Juarez, Mexico to ____________? This writer had a long day returning to watch carefully the protection of the perimeters of the collapsed bldg AND the Offices of restoration and refinishing company , Sungloss. In the middle of the night Servicemaster Company sent a team of pros to both board up the broken skylight and tarp areas of our roof that were slit, weakened or torn. They completed app. 3 a.m. then returned the next day to do more to assist us in both mitigating damages and improving safety standards here. 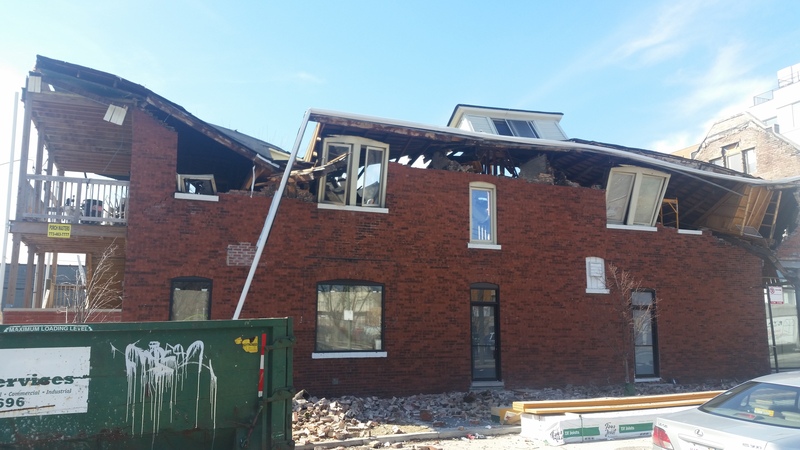 As this writer completes "Sungloss Also Rises"....an Engineer hired by the collapsed building owner will soon decide - can 5001 W. Lawrence in the Jefferson Park neighborhood be salvaged or demolished ??? ( to be continued )..